Ahoy there swimmers, kayakers, canoeists, paddle-boarders and rowers! 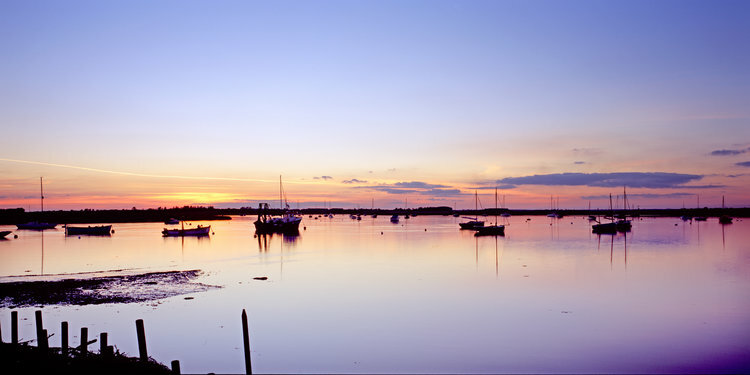 You are invited to participate in a fundraising flotilla in aid of The Alde & Ore Estuary Trust (AOET), starting from Aldeburgh Yacht Club, making your way along our treasured estuary to Orford Sailing Club. The distance is just under 5 miles. With help from the outgoing tide it will take a good swimmer about 1.5 hours and a recreational swimmer 2+ hours. The entry fee donation is £50 per swimmer (maximum 100) and £30 for each kayaker, canoeist, paddle-boarder and rower (maximum 50). The entry fee donation is refundable if, through sponsorship, each swimmer donates £50 or more and each kayaker, canoeist, paddle boarder or rower donates £30 or more to AOET. There will be two classes of swimmers, elite and recreational. The elite swimmers will be timed and use to swimming long distances (3+ miles) in open water. All swimmers will be provided with a numbered, high-vis swimming cap and recreational swimmers will be provided with a towable swimming float which must be used. Non-swimmers will be expected to provide support and act as safety vessels to swimmers if required in light of reduced entrance fee and will be provided with a numbered baseball cap to be worn throughout the event. Our fundraising target for this event is £6,500 so please support us as much as you can. Matched funding is available to help us reach £13,000. Please note, in the event of the flotilla being cancelled due to bad weather or unsuitable conditions, no entry fees or sponsorship will be reimbursed. Before entering the flotilla, please read the following two important documents below. By signing up to the flotilla you confirm you have read and understood the information provided on this website page, in the two documents below and the terms and conditions of participation. Thank you. If you would like to walk this route on the day, please contact the Alde & Ore Association. If you have any flotilla questions, would like to be a sponsor or get involved as a volunteer we would love to hear from you. Please get in touch by emailing us HERE. Following the fundraising success of the inaugural pub quiz in 2017 which raised over £42,000 for the Alde & Ore Estuary Trust, the second one is being held on Friday 22nd November 2019 at 6.30pm. Full details of all participating pubs to follow, but for now please save the date. Craft butchers, Salter & King are hosting Aldeburgh’s marmalade competition again this year and we’d love you to get involved. Entry costs £5 and the closing date to get your jar of marmalade to Salter & King is Wednesday 20th February. The winner’s prize includes a champion cup together with a gammon joint. Seville oranges are available to purchase in the shop and all proceeds are being donated to The Alde & Ore Estuary Trust. Good luck! Available to purchase from Aldeburgh Bookshop, a pack of 6 charity Christmas cards featuring two festive river images. Measuring 5’ x 7”, one card is by illustrator Emma Chichester Clark and the other by Aldeburgh based artist Helen Napper. Each pack contains 3 of each design and retails for £6.00 with £1.50 from the sale of each pack being donated to The Alde & Ore Estuary Trust. The inside of each card reads: With best wishes for Christmas and the New Year. Please call Aldeburgh Bookshop on 01728 452389 if you wish to purchase these cards over the telephone and have them posted out to you. Thanks also to Orwell Press and Herring Bone Design for their support with these charity cards. Following its enormous success last year, a four ferries bike ride is being arranged for Saturday 22nd September 2018 as part of the Trust’s work in raising funds for the river defences. The ride of some 42 miles will cross all of the four Foot Ferries of Suffolk, including the Association's Butley Ferry. The Four Ferries Bike Ride is a charity ride with a difference, taking you along small roads and tracks and potentially using four ferries. Harwich Ferry (you can get there by train) runs across busy shipping lanes with a great view of the port. Next Bawdsey at the mouth of the river Deben, a fast flowing, ever changing river mouth. Then ride on to the peaceful, beautiful Butley Ferry where one is likely to see avocets, marsh harriers and seals and where cyclists are rowed across by volunteers. Last but not in anyway least, Walberswick Ferry crosses the River Blythe, again very tidal and narrow and a real fun experience within easy reach of ice creams and pubs in Southwold. The route can be ridden in either direction. Please come and enjoy this ride through the Suffolk countryside and help the Trust's work in raising funds for river defences on the Alde and Ore Estuary. Please book early to avoid disappointment as a maximum of 100 cyclists can take part. To download a registration form please click here. For guidance notes with more information please click here. If you would like to raise more money for the Trust to help river defences, please click here to download a sponsorship form. The Authors Cricket Club, a wandering cricket team of writers will be playing Sudbourne Hall Cricket Club in a fundraising match in aid of the Alde and Ore Estuary Trust on Sunday 2nd September. 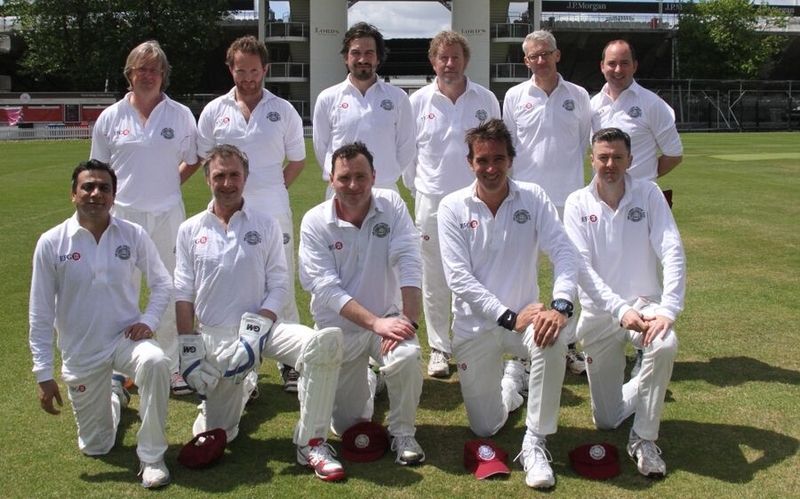 Some of our best-known authors including Sebastian Faulks, Anthony McGowan, Richard Beard, Ben Falk, Matt Thacker, David Owen, Tom Holland, Jonathan Wilson, Jon Hotten and Andrew Lycett, captained by Charlie Campbell, will be taking on Sudbourne Hall Cricket Club. All welcome, with proceeds from the afternoon tea going to The Alde & Ore Estuary Trust. Anyone who would like to donate a cake or sandwiches, kindly contact Clare Greenwell 01394 450440. Thank you. 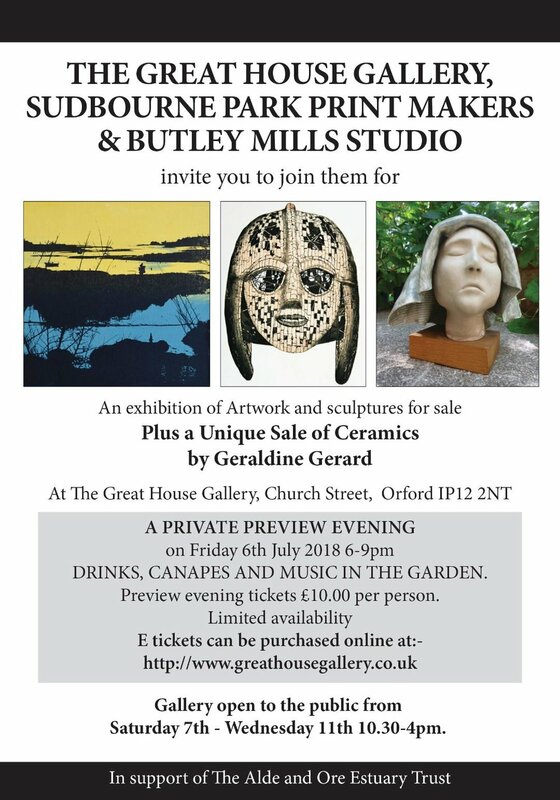 The Great House Gallery, Sudbourne Park Print Makers and Butley Mills Studio invite you to join them for an exhibition of artwork and sculptures for sale, plus a unique sale of ceramics by Geraldine Gerard. Tickets for Private View on 6th July 6pm to 9pm available to purchase here. Curlew Coast - Diversions on Maritime Suffolk by Judith Ellis. 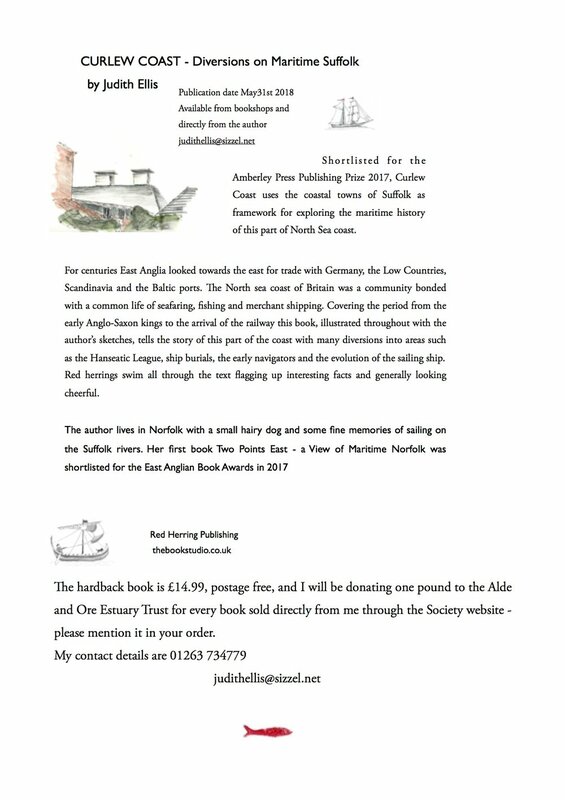 Donation of £1 to Alde & Ore Estuary Trust with each book purchased directly from Judith (please mention AOET in your order). The Alde and Ore Estuary Partnership will be holding their Annual Community Meeting at Snape Maltings Recital Room 14th April 11am-1pm. Coffee will be available from 10.30 am. There will be a number of presentations to inform everyone of the flood defence upgrading schemes and the timetable of events over the next few years. Wine tasting fundraising evening at Orford Town Hall.